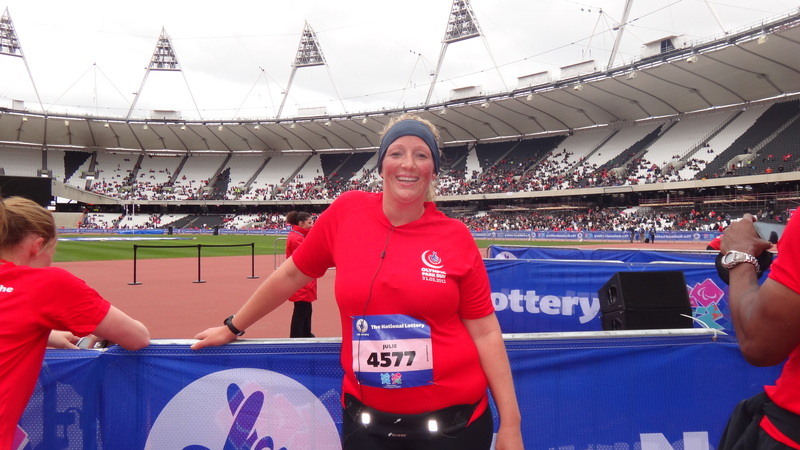 Yesterday I, along with 5000+ other lucky individuals got the chance to be the first to cross the finish line in the London 2012 Olympic Stadium, when we took part in the National Lottery’s Olympic Park Race. Now I have seen the Olympic Park numerous times before, (Due to my job) I must have been on about 15 or so tours of it as its has been built, I was in the Stadium last Xmas when the lights were switched on, bought tickets for the Basketball test event and recently went on a tour of the velodrome and BMX track…plus I live across the road to it, but it didn’t for a minute detract from how exciting it was to be there. 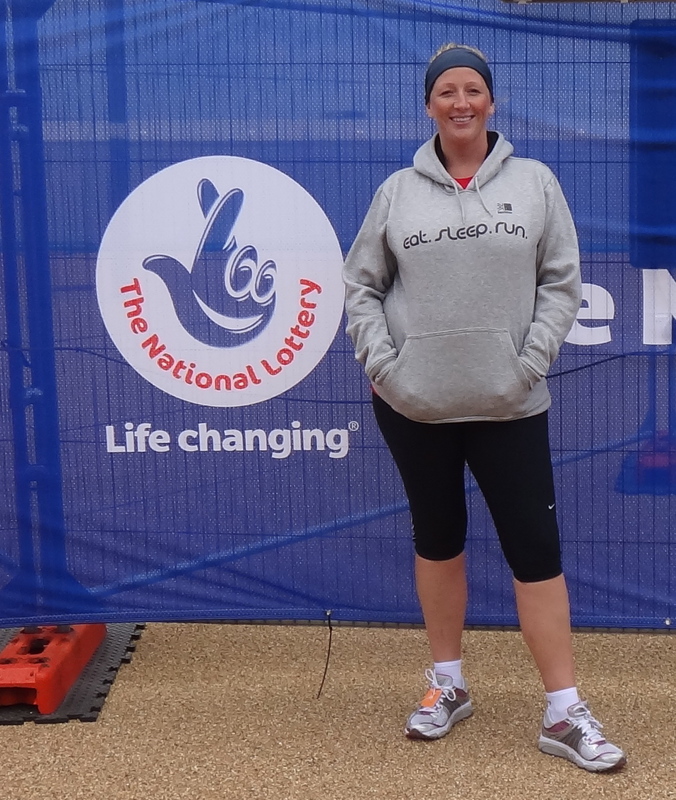 Almost 50,000 people applied from around the UK in a lottery style ballot, and low and behold I got a place, along with a handful of my running buddies from East London Runners, and after checking my facebook yesterday at least another 10 or so of my friends from this area too. The atmosphere in the pens outside the stadium was great, we had almost an hours wait before we kicked off and it was very cold…but we didn’t care…we were making history. 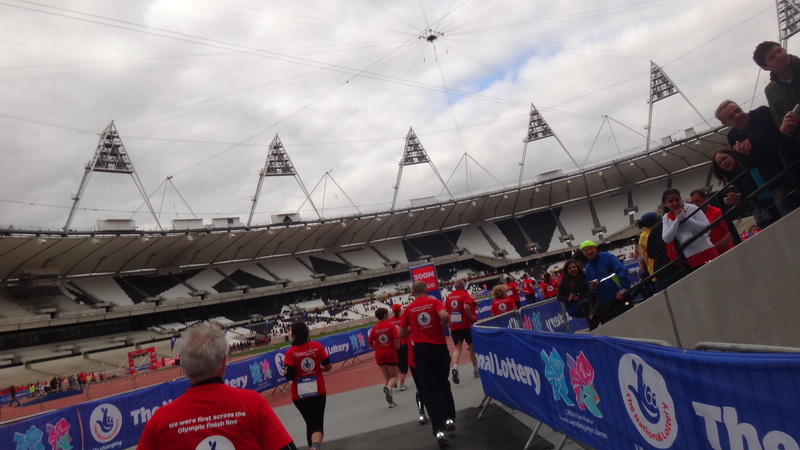 Runners of all abilities in it together…people on crutches, with silly hats, in a kilt, husband and wife teams, powerwalkers oh and the odd celebrity and princess Beatrice no less. And then we were off…I started off quick but got into a good rhythm quite quickly…I felt strong, and enjoyed making my way around the course…which of course was very spectacular…but ultimately still a bit of a building site. At about 3 miles in there was a line of construction staff standing there cheering us on so I shouted out “Get back to work” to which there was an almighty roar of laughter!! 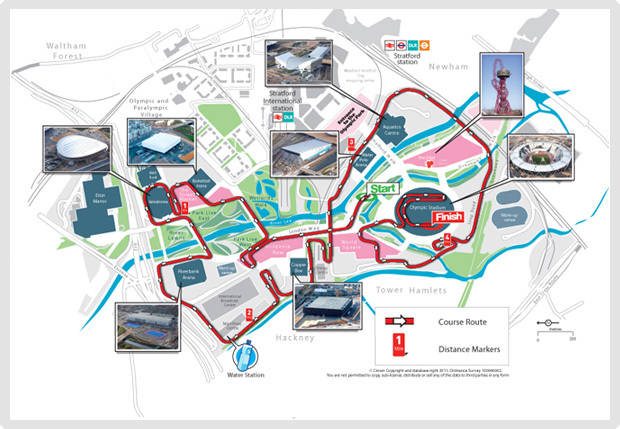 The route snaked in and around the venues, with loads of hills and ramps, brass bands, dohl drums and spectators cheering from the bridges above us… the last mile in the depths of the stadium underpaths to the sounds of chariots of fire was the most dramatic for me. Then before I knew it I was running onto the burgandy track, trying to locate my sister and nephew…I spotted them and Dylan who had been a typical teenage, (ie not wanting to show his excitement at anything) was standing up waving both his arms above his head shouting “Go Julie”, so that was my cue to speed up and I don’t know where I found it but I went into 5th gear and flew round the final bend (at least it felt like I did) I passed the 100 meters to go mark…and thought go on Ju, when else are you ever gonna be on the same track as Usain Bolt…so I engaged the arms and gave it all I had – I got a real funny comment from a teenage cheer leader to her team mates “Rahhh look at her go” which made me laugh all night. I crossed the finish line in 53 minutes and 22 seconds which for me is very quick…mainly down to me not wanting to disappoint my nephew. 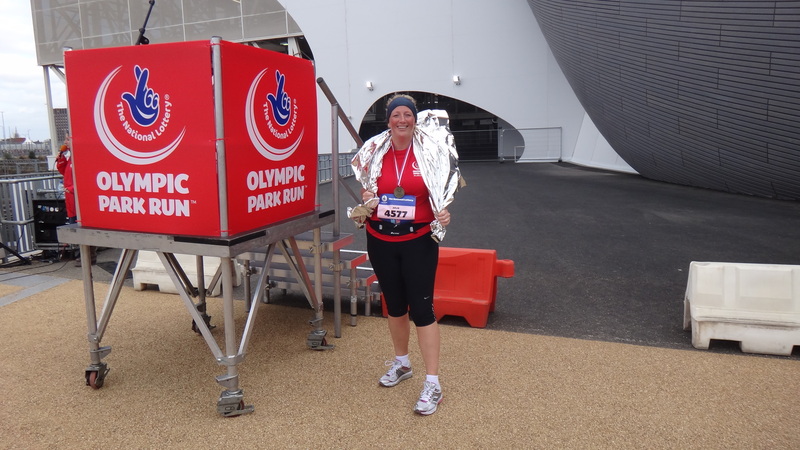 But actually I think I could have even gone faster, I just didn’t want to knacker myself out and look silly in the stadium. Some people don’t understand why I run and sometimes I find it hard to explain the feeling, but the sense of achievement you feel when you finish a race like that, the sense of togetherness you get at the starting line and the fact that so many other people are so impressed with what we do. And for anyone who says the Olympics is a waste of money…the memories that were created in that stadium today were priceless, and the facilities which were very much the stars of the race will be there for years to come inspiring people to get involved in sport. 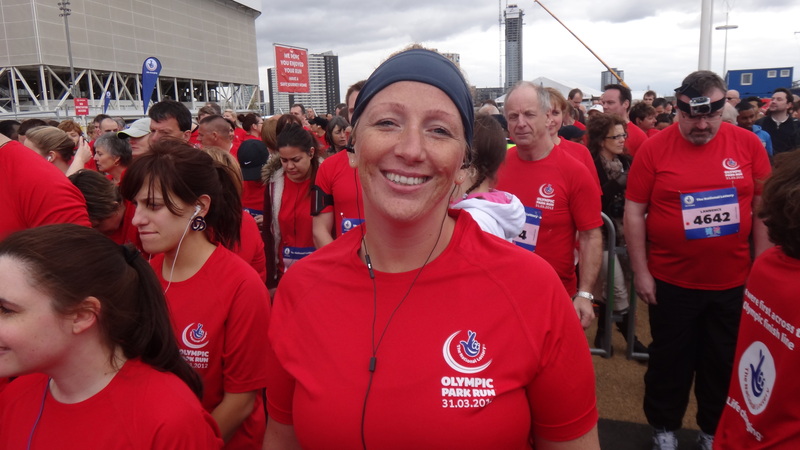 I’m doing the London Marathon in less than 3 weeks…I’ve never done that kind of distance before…and may never do it again after!!! This sounds like it was an amazing event. 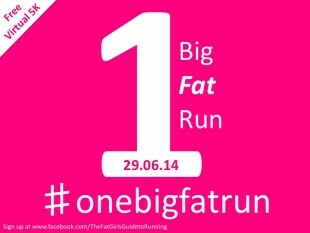 It was probably the best event i’ve done…running wise, and i’ve probably done over 30 of them to date! !